Nonunions of the tibia represent challenging orthopedic problems, which require the surgeon to analyze numerous factors and choose an appropriate treatment. This article presents a case report of tibia and fibula fracture patient who failed the internal fixation surgery and successfully recovered after one course of percutaneous autologous platelet lysates injection. The patient received an internal nickelclad breakage at 9 months post-surgery but reluctant to accept a second surgery, then autologous platelet lysates (APL) injection which is a less invasive method was recommended. The injections were carried once a week for three times. Radiologic evaluation was conducted every month until recovery. To the best of our knowledge, this is the first reported case of tibia delayed union with breakage of the plate resolved with APL injection. Improved clinical evidence was observed at 4 and 6 months after injection. The patient got good bony union at 8 months post-injection. The patient didn’t feel any discomfort postinjection, no complications such as infection, refracture etc. were observed. APL percutaneous injection could be a new therapeutic option for the treatment of nonunion or delayed healing fractures. Bone non-union was defined by US Food and Drugs Administration (FDA) as radiographically visible fracture line after 9 months since injury and delayed union was clinically defined as a fracture with no signs of healing for three consecutive months (Megas 2005). Nonunion of the tibia represents a challenging orthopedic problem, which requires the surgeon to analyze numerous factors and choose an appropriate treatment. Tibia nonunion treatment requires a clear identification of its diagnosis and cause. Nonunion or delayed union has been one of the most severe complications of a fracture surgery, and the current failure rate in non-union surgeries is approximately 20% (Tzioupis and Giannoudis 2007). Recent advances in cellular and molecular biology have emphasized the role of specific growth factors and cytokines in bone fracture healing (Simpson et al. 2006). Autologous platelet lysates (APL) is a kind of platelet cleavage product which is prepared by high speed centrifugation, freeze-thawing, and supernatant abstraction of the peripheral blood. The activated platelet could release a series of growth factors and cytokines that act synergistically to facilitate MSC attachment, proliferation and differentiation, while the potential effects of APL on bone regeneration need to be investigated. Besides, the exact amounts of key factors such as PDGF-BB, TGF-β1, EGF, IGF-1 need to be detected and APL preparation quality control should be emphasized (Altaie et al. 2016; Chen et al. 2013; Civinini et al. 2011). 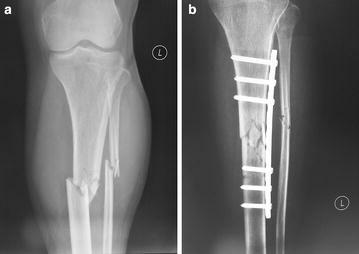 This study describes a case report of a patient with fractures of tibia and fibula that failed the surgical treatment and successfully treated with APL. A 64-year-old woman was involved in an accident, and she was diagnosed as fractures of left tibia and fibula at Weihai Municipal Hospital at September 17th, 2013. Initial treatment involved incision reduction and a metal plate internal fixation surgery was performed (Fig. 1). The X-ray radiographs were taken every month after the surgery. After 4 months, the radiographs revealed clearly fibula osseous collection and the fibula fracture almost healed, but minimal callus formation was seen and there was a gap in the tibia fracture site (Fig. 2a). The fibula fracture gap disappeared and the fibula got bony union in the sixth month after the surgery. However, through radiologic assessment, no signs of healing in the tibia were observed (Fig. 2b). On June 7th, 2014 (9 months post injury), the patient went to our station with increasing clinical manifestations of pain at the fracture site over the prior. Radiography revealed tibia fracture stump sclerosis and the breakage of the nickelclad, and tibia non-union was diagnosed (Fig. 2c, d). Incision surgical repair with exchange plate was offered at first because of a visible fracture gap, but the patient preferred less invasive options. Routine blood test didn’t show any abnormality. Since the patient was in a satisfactory nutritional status and her skin and local tissues were in good condition with a straight limb alignment, percutaneous injections of platelet lysates from vein blood concentrate were performed under her permission. We obtained an informed consent from the patient for participating in clinical therapy regarding percutaneous APL injection in patients with nonunion. The clinical study protocol was approved by the ethics committees of our hospital. After the subject eligibility was confirmed, the patient was registered. Written informed consent for publication of this case report was obtained from the patient. The patient was treated by one course of platelet lysates injections, and the platelet lysates were prepared as follows: approximately 40 mL of peripheral vein blood was withdrawn into a syringe containing 1000 IU low molecular weight heparin sodium and then the blood was carefully carried to a local 100 grade purification laboratory for further treatment. After transferred into several centrifuge tubes, the peripheral blood was centrifuged at 200g for 20 min at room temperature (Thermo, USA) and then three layers were separated. Platelet rich plasma (PRP) in the middle layer (about 20 mL) was withdrawn and subpackaged into three vacuum tubes (Fisher, USA). Then the tubes were cryopreservation at −80 °C overnight and one of them was resuscitated in the 37 °C water bath kettle in 5 min. After repeatedly freeze thawing more than twice, a variety of growth factors and cytokines were released from the platelet concentrates such as platelet-derived growth factors, transforming growth factor-beta, vascular endothelial growth factors (VEGF) etc. The thawing and activated plasma was centrifuged at 1700g for 6 min (centrifugation radius is 9 cm) to separate the platelet fragmentation in the under layer. The supernatant was filtered to remove cellular debris and WBC contamination is minimized by leukodepletion steps. The leucocyte reduction step is applied by the buffy coat method (Altaie et al. 2016; Singh et al. 2009). 10 mg/mL deoxycycline (APP Pharm, USA) was added into the filtered supernatant with a volume ratio of 1000:1 and then the APL which contains the cocktail of factors released by the platelets was obtained after filtration. The mean volume of APL injected in our series was 5 mL for each infiltration. The quantitative measurement of PDGF-BB, TGF-β1, IGF-1and EGF concentrations in whole blood and APL were determined using enzyme-linked immunosorbent assay (ELISA) kits according to the manufacturer’s protocols (R&D Systems, Minneapolis, MN, USA). The micro-plate provided has been pre-coated with specific antibody, then standards or samples were added to the appropriate microtiter plate wells with biotin-conjugated antibody specific for these factors and avidin conjugated to horseradish peroxidase was added to each microplate well and incubated. Then a substrate solution was added to each well. Only those wells that contain specific factors will exhibit a change in color. The enzyme-substrate reaction was terminated by the addition of a sulphuric acid solution and the color change was measured spectrophotometrically at a wavelength of 450 ± 2 nm. The concentration of the growth factors was then determined by comparing the OD of the samples to the standard curve. The injection was carried out once a week with three injections in one course of treatment. The injection procedure was carried in the operation room under the fluoroscopic guidance. The patient was asked in the supine position with combined spinal–epidural anesthesia. The broken ends of the fracture were confirmed under C-arm and a small needle knife was inserted to the fracture site. After the dissection and brisement of fibrous scar tissue and sclerotic tissue, a disposable needle was inserted perpendicularly into periosteum at the gap of delayed union under fluoroscopic guidance, and then 5 mL of the buffered APL was injected into the area of abnormality (Fig. 3a). Prophylactic antibiotics were routinely used at the first 48 h after injection. Weight bearing was prohibited within 24 h after injection. Painless functional training was initiated the next day. Partial bearing was allowed after 3 weeks. After 8 weeks, full bearing was allowed. The use of nonsteroidal anti-inflammatory medication was prohibited during the first 4 weeks after injection. Radiologic evaluation was carried out every month after operation. Routine anteroposterior and lateral tibial X-rays were performed at every subsequent visit to estimate the union healing situation. The data was presented as the mean ± SD. A Student’s t test was used to determine the significance between the groups. P values of <0.05 were considered significant. All statistical analyses were performed with the SPSS (Statistical Package for the Social Sciences) 13.0 software. The factor level detection results (Table 1) showed that the concentration of PDGF-BB, TGF-β1, IGF-1 and EGF in APL were significantly higher than those in the whole blood (P < 0.05), and most of the detected factors increased at least three times. Two, four and six months after platelet lysates treatment, X-rays showed gradual and abundant callus formation in the tibia fracture site (Fig. 3b–d). More remarkable clinical evidence was shown as there was obvious osseous collection in the tibia fracture site in 6 months after injection (Fig. 3d). The patient reported minimal pain and bony union was almost achieved in 8 months after injection. The patient didn’t feel any post-injection discomfort, no complications such as infection, refracture etc. were observed. Bony union was achieved after demolishing the nickelclad at in 12 months after injection (Fig. 4c, d). The patient has returned to her normal activity without pain.